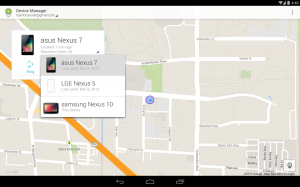 The Android Device Manager is one of the most useful tools from Google when we have located all of our devices. This simple app allows us to locate your phone if you have lost and also offers the possibility of a small but useful actions such as changing the pin or erase data from our device. Initially, we only had the web version of this program but a few months ago Google launched its mobile version. It can be downloaded from the Play Store, and it can help us in more than one situation. First of all, we must have a Google account, and our Android devices associated to it. Once we have all the devices associated correctly, we can access to the web version of the Android Device Manager or initiate the app from one of our mobile devices, to see the location of all our phones and tablets. The have 3 actions available: sound an alarm, lock the device and change the PIN of the unlocking screen, and erase all the data of the device. The first option is very useful if we have our phone or tablet lost on a nearby area, as it sounds an alarm at full volume for 5 minutes. This will allow us to find the device if we know about its approximate location. The second option offers a degree of protection, allowing us to lock the screen and redefining an unlock pattern. It is always something good to do if somebody has stolen our device, especially if we did not have password or locking pattern and nothing prevents the thief to access to all our content. And finally, with the third option we can delete all the content of our smartphone or tablet. In the worst situation, if somebody has stolen our device and we think that we will not recover it in a near future, it is advisable to clear its contents, because all the information we have stored will be available to the thieves. What if we don’t have another mobile device or a PC? What can we do when we’re on the street, somebody has stolen our phone and we don’t have at hand any other phone or PC to connect to Android Device Manager? Well, there is still hope, we still have a chance. The Android Device Manager allows us to connect with the mobile phone of another person. Thus, we can ask a friend for help and connect to his app as a guest user. Thus, we can access to all the features of our smartphone, make it sound the alarm, lock the screen, erase our data and locate it on the map. 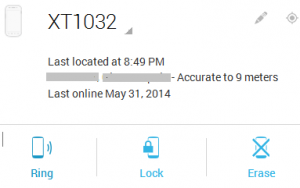 We can download Android Device Manager for free from the Play Store.